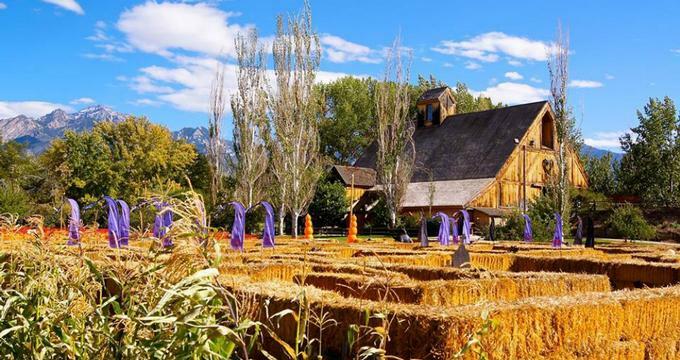 The Wheeler Historic Farm in Utah is an agriculture museum and outdoor recreation site managed by Salt Lake Parks and Recreation. Sitting on 75 acres, the site is home to nearly 6,000 pieces associated with Utah’s farming history and early homestead life. In 1853, Joseph Hammond bought two farms in South Cottonwood, Utah, 70 acres of which would become Wheeler Historic Farm. In 1864 Hammond sold the farm to Ole Hanson, who then traded the farm to William Goodall Young. William and his wife, Martha, moved onto the property in 1870. In 1884, Elizabeth Cooper Pixton bought the farm and later sold it to Sariah and Henry Wheeler, her daughter and son-in-law. The Wheelers lived in an adobe home built by Ole Hanson, but Sariah saw herself living the good life in a roomy Victorian farmhouse. In 1898 the house was built, using bricks from the old abode house. Some of the outbuildings built around the home still stand on the property. Salt Lake County bought the farm in 1969, planning to remove the historic buildings and develop a regional park with baseball fields, tennis courts, and other services. In 1974, the Junior League of Salt Lake proposed to preserve the buildings and create a living historical farm. The plan was authorized, and through donations from the Bicentennial Commission, Community Development and National Historic Preservation Foundation, important repairs and purchase of artifacts took place. Wheeler Historic Farm officially opened to the public in 1976. Wheeler Farm is a perfect destination for families to take their kids for a day of fun. There are many activities for everyone to enjoy. Activity Barn – The Activity Barn's second floor offers exhibits showing early farming. Information about the Wheelers, the nearby areas and the progressive farm period are also available. Animals – The Wheeler Historic Farm is a "working farm." All animals serve a farming purpose and are not tame. Playground Fort – The Playground Fort is quickly becoming a favorite on the farm, and was a project of the Wheeler Farm Friends and Salt Lake County Parks and Recreation. Work completed on the playground in 2011, with a toddler addition funded by the Dumke Foundation. Wheeler Woods and Little Cottonwood Creek – These woods are a natural countryside retreat in the middle of the city. Trees, shrubs, and wetlands run along the creek, as do daily wagon rides. Farm House Tours – Building began on the Wheeler Historic Farm home in 1896, and renovation of a turn-of-the-century museum started in 1975. The tour runs one hour and includes the whole house. Wheeler Farm provides educational opportunities for kids as well as adults. Traditional learning and classroom experiences as well as hands-on training can be found here. Outdoor Education Building – This building provides the Future Farmers of America a classroom setting and space to raise animals and perform farming duties. Field Trips – Wheeler Historic Farm offers guided tours highlighting family farm life in the early 20th century. Cub Scout Patch – Wheeler Historic Farm has a Cub Scout patch awarded for finishing the requirements with their Den, Pack, or Family. Woodcarving – The Great Salt Lake Woodcarvers meet at the Wheeler Historic Farm to enjoy the art of woodcarving. Horse Camp – Wheeler Historic Farm horse camp is open to beginner level riders aged 8-14. Some daily duties include grooming, tacking, feeding, cleaning, and riding. Wheeler Farm hosts many events throughout the year that coincide with holidays and other special times of the year. They are all family-friendly and a whole lot of fun for everyone. Woodcarvers Show and Competition – The Great Salt Lake Woodcarvers Annual Show and Competition feature work from artists across Utah and many other states. Easter Dog Bone Hunt – Bring the pup out to the Wheeler Historic Farm Easter Bone Hunt. Grouped by size, dogs get to search for bone-filled Easter eggs scattered throughout the area. Children’s Easter Egg Hunt – The Wheeler Farm Annual Children’s Easter Egg Hunt provides a safe, stampede-free environment for children of all ages. Participants receive a visit with the Easter bunny, an Easter pail, goodies, and a wagon ride. May Farm Fest – The May Farm Fest is a day of farming fun. Music and entertainment are provided throughout the day, as well as free tours of the farmhouse, sheep shearing, blacksmithing, and wagon rides. Pumpkin Days – This family-friendly event includes a pumpkin patch, hay maze, cow train, and wagon rides! Dog Dayz in the Maze – Celebrate Halloween with the pup. All dogs get treats, a fall wagon ride, and a ticket to the straw bale maze. Scarecrow Contest – This annual contest on the Wheeler Historic Farm is fun for the whole family. Funny, happy, innovative, and creative, but not-too-scary scarecrows will be on display for all to see. Do you want some homemade items that you can't find at the town grocery store? You have come to the right place then. Rosebud Country Store – Gifts from local Utah sellers, toys, and games, as well as farm-related items, are found at the Rosebud Country Store. Snacks, drinks, and local honey are also available for purchase.